I spotted Krystal the other day while I was looking for a copy of the Style.com/Print magazine at Quimby’s on North Avenue. I am really strict with myself about never pulling customers (or sales associates) out of stores because I never want to be disruptive to businesses. So when I saw Krystal browsing the Zine rack, I crept outside to wait. And wait. And wait. I watched two North Avenue buses sail past before Krystal walked out but it was totally worth it. 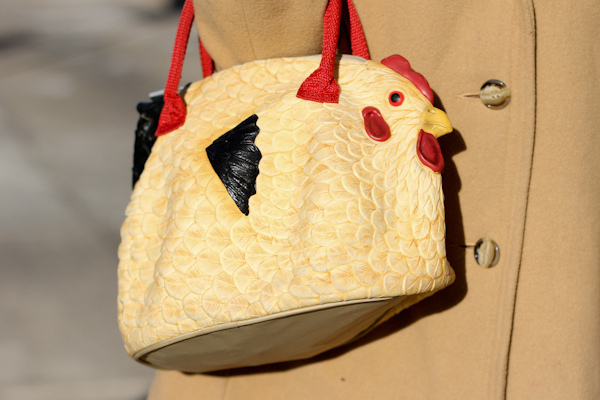 I mean seriously, a rubber chicken handbag; there was no way in hell I would pass up the opportunity to snap a street-style photograph of such an intriguing accessory. She told me she purchased it at the Art Institute gift shop. Humor and great design in one piece, how genius! Just kidding… you all recognize my good friend Nicole Blaje. She never ceases to amaze me with her ability to mix whimsy with a dark sense of drama. I adore her. There are very few people in Chicago who can mix Miu Miu bejeweled sandals, a tiara, and a dramatic TopShop coat to create such a stylish look. Nicole is one of them. A few weeks ago I had the pleasure of running into Audrey of A Lovely Escape at p.45, which was totally unplanned as I had gone there to meet up with Andrea of Blonde Bedhead. The Eugenia Kim event was like fashion blogger catnip! Audrey’s photo above was also featured on Refinery29 yesterday. Check out that post here.